LEARN HOW TO INCREASE YOUR SECURITY, OUTSMART THE BAD GUY, AND EMPOWER YOURSELF WITH TWENTY-SIX SELF-DEFENSE DECISIONS THAT COULD SAVE YOUR LIFE. It’s an unfortunate reality that women are susceptible to random acts of aggression and violence. But they can learn how to protect themselves—with this groundbreaking guidebook. Let martial arts black belt and accomplished journalist Lori Hartman Gervasi walk you through the steps for taking charge of your personal safety. Her program consists of twenty-six potentially life-saving decisions that every woman must make. Each choice will identify threats, provide practical knowledge, prevent victimization, and save valuable time in the midst of danger. The book includes Mental Decisions that are necessary to prepare the reader’s intellect, utilize her instincts, and assure her emotional well-being. 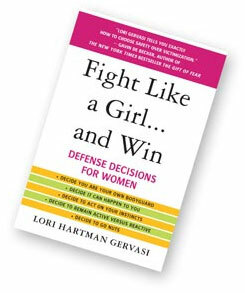 The Physical Decisions will prompt her to have an automatic and effective response in a real life fight. Whether or not she’s a fighter, and what she can do in either case. The four levels of force and the legal right to defend one’s self at each of those levels. The three things a woman can be sure of when she finds herself in a physical battle with a man. What crimes females fear most. The four most common ways women are attacked. How a woman’s understanding of herself and her attacker will ensure victory. The dirty truth about fighting that her dad never told her (but probably taught her brother). Why a woman’s mental fight needs to be a priority before any battle. How personal decisions are a woman’s keys to success. Fight Like a Girl…and Win makes it possible for women to be confident and safe, while experiencing peace of mind, in the midst of a violent world. Your Crane Technique is no match for Blue Jay Technologies.